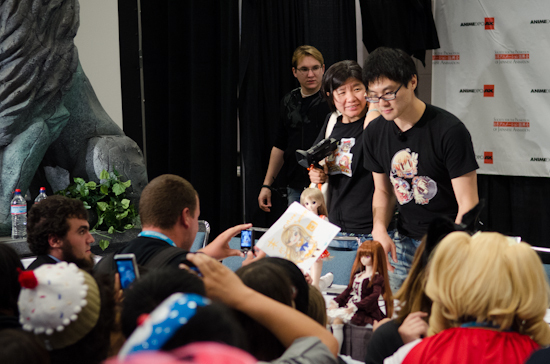 The first sighting of Danny Choo was in the lobby of the convention center. 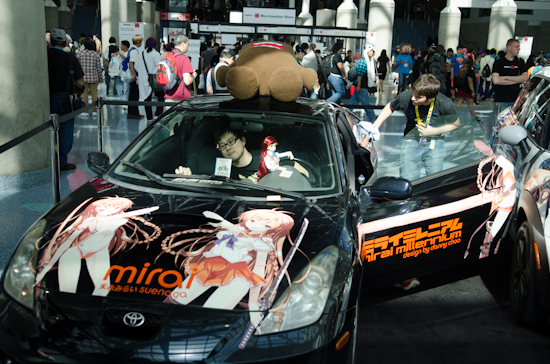 In the middle of the lobby there were three Mirai Suenaga Itasha and Danny was decorating them with his dolfies and the Moekana card game. 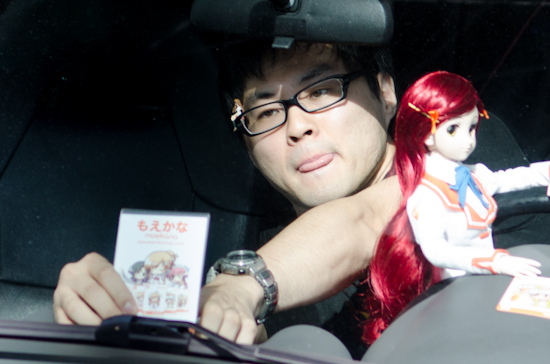 Here we see Mr Choo making a “pfffffft” face while sporting his otaku glasses that have a tiny Mirai Suenaga sitting on the corner. Danny takes a break from decorating to practice his Hiragana with the Moekana card game. 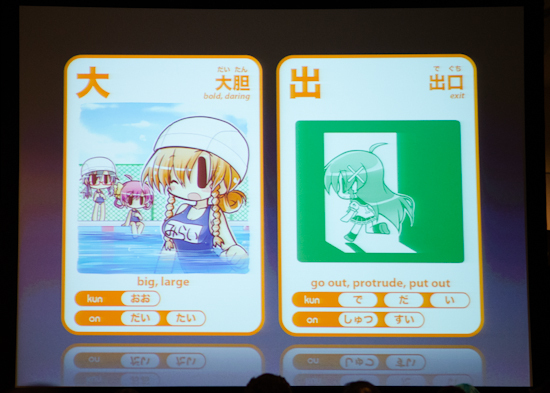 Decks of Moekana were available to purchase at the Toylet and J-List booths in the Exhibitor’s Hall. I ended up snagging two for myself. With each purchase at the convention you got a free exclusive shougakusei しょうがくせい card. 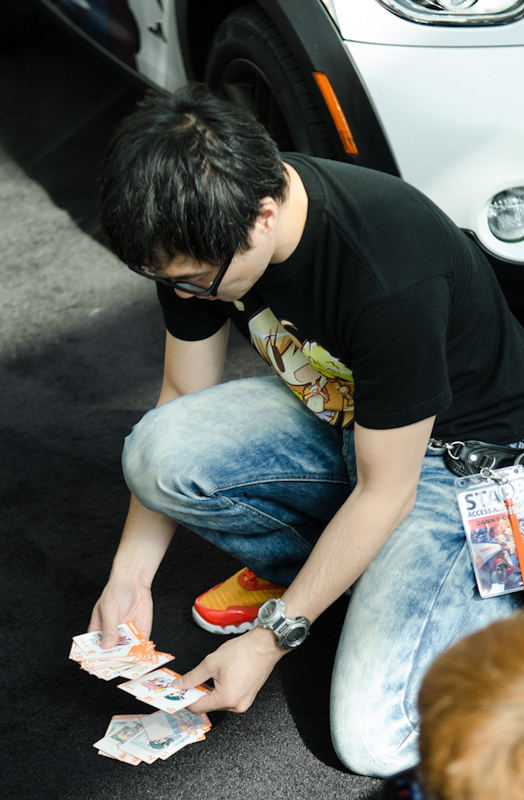 Danny was nice enough to give the special cards to those who had already ordered their decks online. 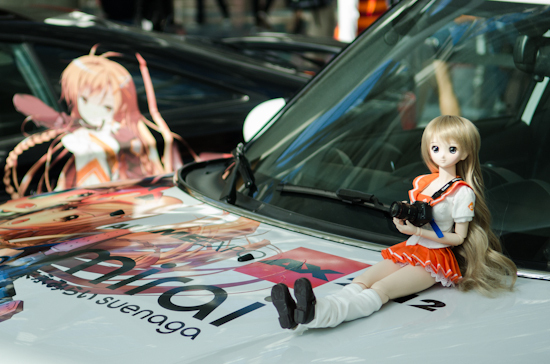 Here we see Danny’s Mirai Suenaga dolfie chilling on the Mirai Itasha. Dolfies have a way of creeping me out sometimes. They look all innocent until they attack you at night! 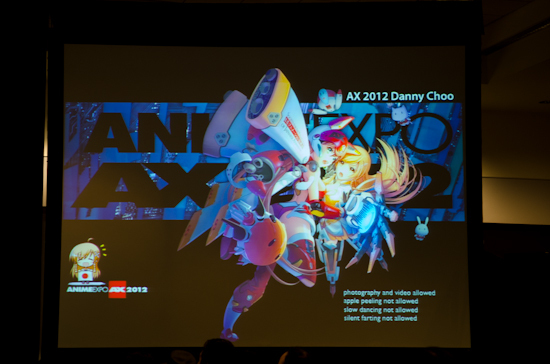 The second time I got to see Danny Choo was during his panel Saturday night. It was a tough choice because the Yuki Kajiura concert I wanted to go to overlapped with Danny’s panel. In the end Danny won. 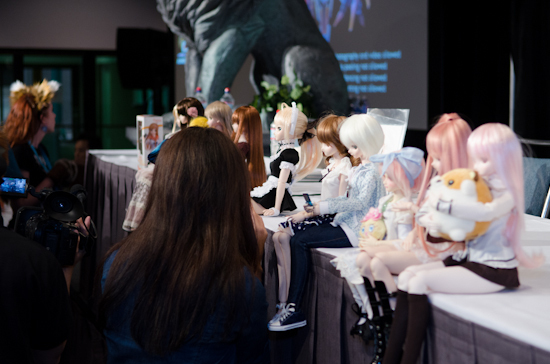 At the begining of the panel Danny invited the attendees to put their “daughters” (dolfies) up on the stage. 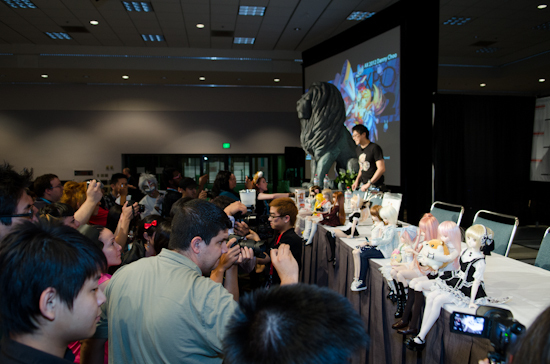 This drew a big crowd of people taking photos of them while Danny Choo set up for his panel. The first part of his panel Danny talked about how he got into anime and his love for Japanese culture. Then he discussed his current projects such as just getting back from Anime Festival Asia in Malaysia as well as starting on the World Wide Otaku Report. The World Wide Otaku Report will be a book in conjunction with ASCII media which will give insight into the lives of otaku around the world who consume Japanese Pop Culture. The submissions deadline for the World Wide Otaku Report is July 20th,2012 so if you’re interested then head on over quickly! 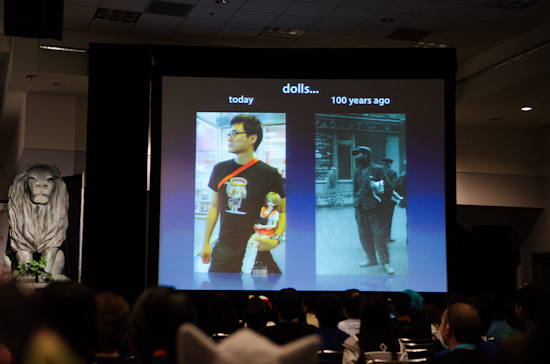 Next on topic was the Mirai Suenaga franchise. Mirai is the mascot for Culture Japan and the foundation of the merchandise empire that Danny will be building in the upcoming months. 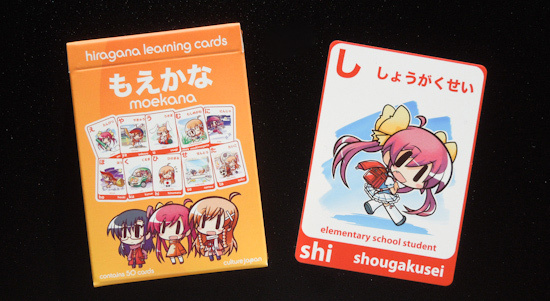 After the successful launch of the Moekana card game that helps people learn Hiragana the next logical step is to venture into helping people learn Kanji. It sounded like a lot of people in the industry didn’t think Moekana would be that popular but Danny proved them wrong. 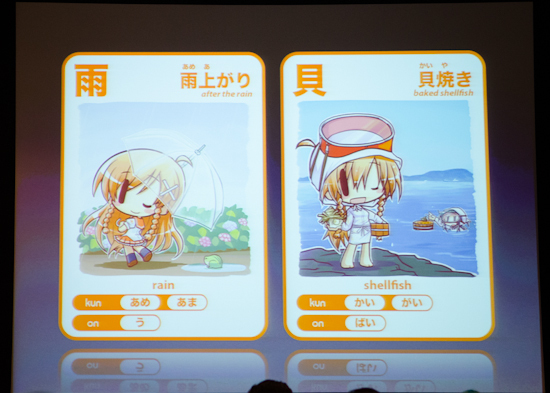 The next few images are samples from the upcoming Kanji expansion to Moekana. Here we see 字 as used in 文字 – letter (of alphabet) and 休 as used in お休み – sleep, good night. The cards still feature the adorable illustrations of Ikkyuu. Above are cards for 大 as used in 大胆 – bold, daring and 出 as used in 出口 – exit. Finally a few more examples of 雨 as used in 雨上がり and 貝 as used in 貝焼き- baked shellfish. Danny explained that these cards won’t be targeted to those who are new to the Japanese language but to those who have somewhat of a grasp on kana. If you’re learning Kanji now do you think these would be helpful? Now to the toys! 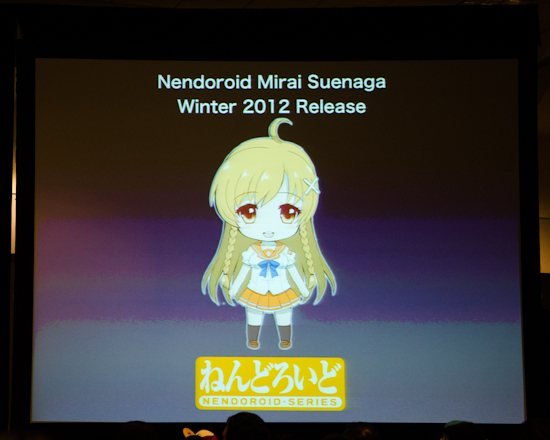 Danny Choo announced that this winter they will release a Nendoroid version of Mirai Suenaga. I’m sure this will sell just as well if not better than the Mirai Figma that had ranked number 3 in toy sales on Amazon Japan. 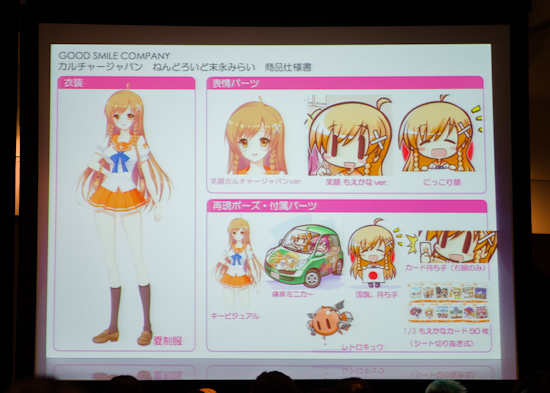 The final design of the Nendoroid isn’t done yet but in this slide we get a preview of what faces Mirai will come with. 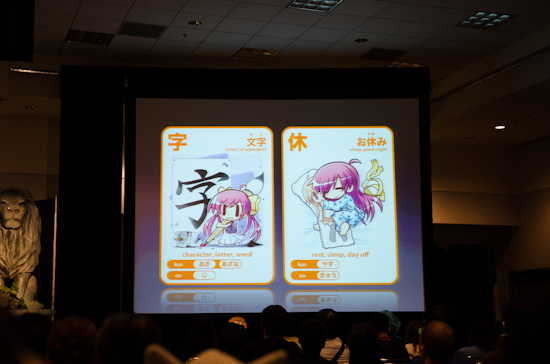 Two of which will be from the Moekana card game. Also the Nendoroid will come with lots of accessories including her own Itasha that she’ll be able to ride in, a Japanese Flag, her little robot friend, and a Nendoroid sized deck of Moekana cards. Although Danny hasn’t announced this yet on his website you can see him hinting at it with this blog post about the tiny Moekana cards. 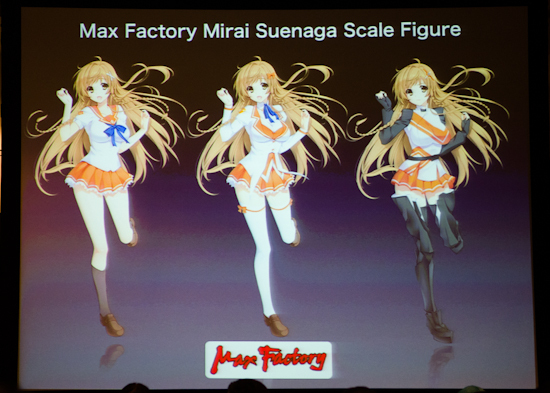 Final announcement on the toy front is that Max Factory will be releasing a scale figure of Mirai Suenaga. The hope is that it would be a “cast-off” figure so that one can change between Mirai’s school uniform, work uniform, and Solar Marine getup. Hopefully they can accomplish that without the clothes looking to bulky and seams are hidden. After the information about future plans Danny Choo then went into a really nice speech about taking risks and pursuing your dreams. The examples of ants and pandas were given that they do their same routine day after day… and sometimes we can be just like them, going to work, eating, pooping, going to work, eating, pooping, etc, etc. Doing that we’ll never be able to reach our dreams and desires. It’s taking risks and putting yourself out there that will make you successful. At the end of the panel comrades rushed up to get photos or try to talk to Danny but that was cut short because staff had to clear out the room in preparations for the dance. However, the following day on Sunday Danny held a meet-and-greet where people could socialize and talk to Danny. I wish I could have gone but I had a plane to catch. I’m really glad I made it to his panel. Danny is an engaging speaker whose humor, knowledge and contribution to Japanese Pop Culture made it one of my favorite panels so far. Although dolfies still creep me out, I’ve got a renewed respect for the guy. This entry was posted on Monday, July 16th, 2012 at 9:30 am	and is filed under Conventions, guest panels. You can follow any responses to this entry through the RSS 2.0 feed. You can leave a response, or trackback from your own site. You’ll need to dring a doll next time!